If your tomato plants are becoming unruly, it’s time to discipline them a bit—tieing* them, in other words. I began tieing my plants the other day. I knew it was time because they were all but screaming, “Tie me!” and were beginning to droop out of their cages toward the ground. If you tie them promptly where you want them, all should be well. But if you don’t reposition them and their growing stems harden, you probably will have a difficult, if not impossible, time trying to do so later. Actually, tieing has been minimal this year in the Tomato Patch. The reason is that I’ve pinched suckers regularly, so I have reduced tieing needs by 50% or more. The suckers I removed never had a chance to grow long enough to need tieing. What do I use for tieing? This year I’m using jute gardening twine that I bought at a neighborhood Ace Hardware store. 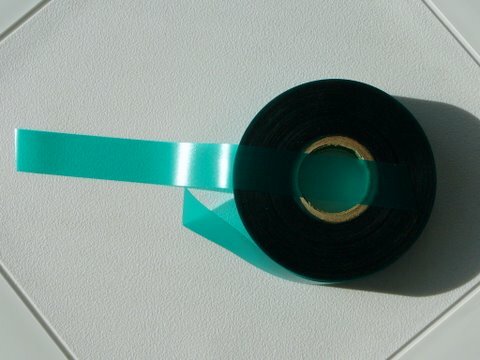 In the past I’ve used strips of an old sheet that I tore into half-inch strips about a foot long, as well as rolls of half-inch, slightly stretchable green plastic tieing tape available at most good nurseries. I’ve also used tops of pantyhose cut into narrow strips. Don’t laugh—pantyhose was the top response several years ago when I queried Howard County Master Gardeners about what they use to tie their tomatoes. (1) Tie before a stem begins hardening so you can reposition it without breaking it. Once you tie the stem where you want it, it will gradually harden as it grows and will need less support from the tie. Pantyhose top, the perfect tie? (2) Use a tie that is strong enough to last the season but soft enough not to cut into the tomato stem when summer storms blow though. That’s why I’m using jute gardening twine, which is soft but strong enough, and not nylon string, which is very strong but may cut the stems. Pantyhose is both strong and soft. 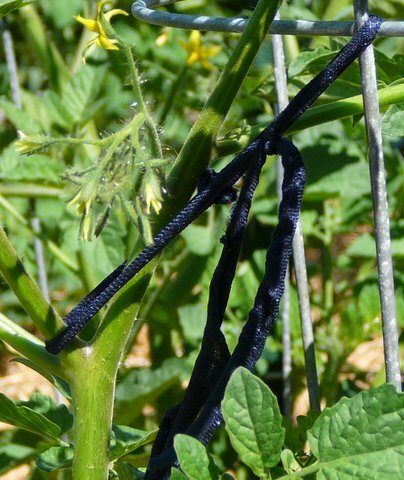 (3) Tie the stem loosely to the cage or stake, leaving enough slack in the tie for the growing stem to expand. In addition to its strength and relative softness, pantyhose strips have enough “give” in them for stems to expand as they grow. (4) Consider fall clean-up when you choose the kind of tie you use. At the end of the season, I can just cut the jute ties with scissors or a knife and let them drop. Over time they will decompose and become part of the garden soil. By contrast, I’ll have to pick up and throw away nylon string, plastic tape, or pantyhose. If your back is about as old as mine, think of the benefits of not having to bend and pick up scores of non-biodegradable ties. Since I had been pinching suckers and had relatively little tieing to do, the job took about a half hour—and that included pausing here and there to pinch new suckers—and a few that I had missed during earlier pinchings. 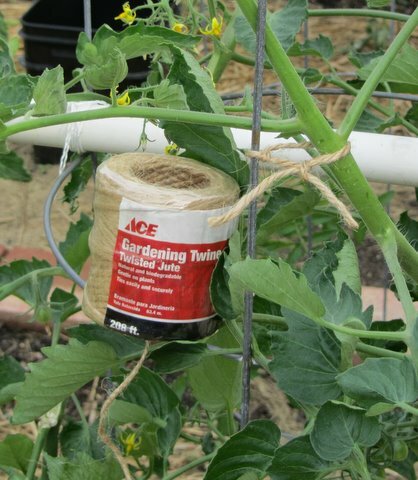 To keep your Tomato Patch from becoming an unruly jungle, tie your plants and continue to pinch suckers. ← Carroll County “Grow It Eat It” team produces High Results with their High Tunnel. Our tomato plants are getting unruly. Thanks for the tips on how to tie them. I will need to change to a softer material for tying. McArtor: I would add that a “sharper” tieing material might pass muster if its diameter is larger, rather than smaller, and you give enough slack that the supported stem can grow. But, overall, soft-strong ties are better than hard-strong ties.